Stylishly benefiting your lifestyle with Samsung Galaxy S3 mini. When come to gadgets, i've not much desire chasing after the latest trend. 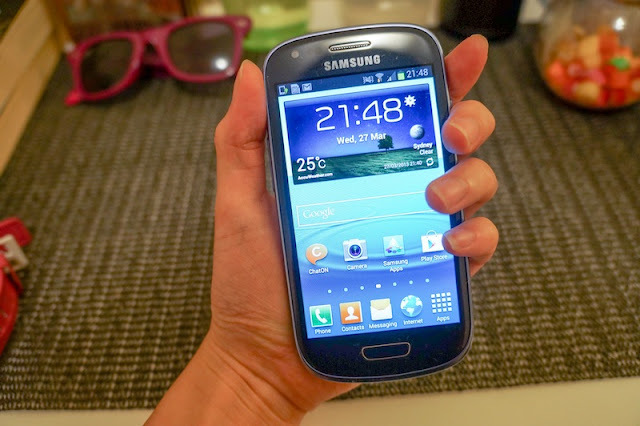 But the new Samsung Galaxy S3 mini has caught my eye. Despite all the good feedbacks coming from my friends who are either the users of Samsung Note or Galaxy series, i wasn't ever interested because they're all quite big and i'd rather have a smaller sized phone. When Galaxy S3 mini came out, I'm really impressed with the size as it fits with my lifestyle perfectly. Why do i say so even i'm not a gadget-freak? 1. Selca selca selca all day long. 2. Took 100 pictures, select 1, edit it with few photography applications, upload to social media websites! 3. 24/7 checking new updates. 4. Watching or listening videos on Youtube for freeeeee! As if i'm always on social websites almost 24/7, i would need good camera (5.0 megapixels) to upload many pichas to Instagram that interlinks to other social media websites like Twitter or Facebook. To do so i'll need longer battery life (1,500 mAh). Despite that, it also packs the same 'smart' features of its bigger brother and a vast array of capabilities that makes it one of the strongest contenders within its category. See details of its feature here, www.samsung.com/my/s3mini. 1. Took 1 picture, upload to social media website. 2. 24/7 checking social media website new updates, most probably stalking on hot girls. 3. Watching live score on NBA or football apps. 4. Reading MeMe readers or Youtube-ing. So yea, guys are definitely needed their smartphones to have longer battery life. WE WANT LONG BATTERY LIFE!!! Samsung Galaxy S3 mini means a lot more to me other than their size. 'Mini' means more. Mini can be brilliant, mini can be practical, mini can be full of surprises, mini can be attractive, mini can be cool. Beside the coolness of Galaxy S3 mini, you might also want the people around you to own a smartphone so that you could snap and share great pictures, and stay in touch with them. Priced at RM999.00, it's probably a good mobile deal for bargain hunters who wishes to change/upgrade their phones but could not afford one. Don't miss out the chance to stay on the cutting edge with Samsung Galaxy S3 Mini! Stay mini, compact yet powerful.